While you may find some negative feedback (evaluations) at Amazon; please look at the date (our record is 100% positive for the last 12months), we did have some minor problems of course at the beginning which have been corrected long time ago, also we offer an A-Z GUARANTEE, The packing has been greatly improved too. Other negative evaluations are simply because people did not follow the instructions and finally... there are some lies too. That happens when you disrupt markets, and affect established interests. 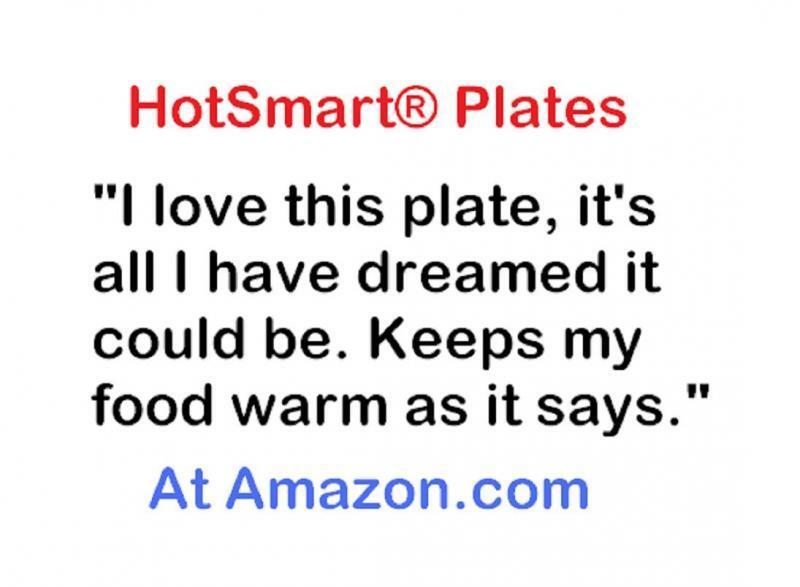 We have a "first in history"
FACT; HotSmart Gourmet Plates are the only plates in the world that really keep food warm and keep selling fast in Amazon.com; we decided to create this page to answer Frequent Asked Questions and feedback from our customers. The specifications SPECS of the plate will show you that this modest invention is actually a quantum leap for the ceramic plate which had not evolved functionally in centuries http://bit.ly/AreWeDumb , however we don't want you to have false expectations ; the plates were developed for an specific purpose: to keep food warm at the table so you can enjoy your best recipes; follow the instructions use the plate properly and you will enjoy it for a long time. Does the base separates from the plate? No, the seal has been improved; sometimes we have to open a plate for experimenting (or ongoing testing) and we cut the adhesive all around the joint with a very sharp knife which takes us a long time; then we have to pry open the plate with a flat screw driver and that also takes lots of effort (sometimes the base would break before it separates). however If you do not follow the instructions you could break the seal; and the plate will not work properly with water inside. In that case, all you have to do is to preheat the plate a few times until you get rid of all the humidity inside, then continue using the plate and don't put it in the dishwasher anymore. A dishwasher safe version is being developed. No, We are working on a dishwasher-safe version: an hour glass shaped seal (among other designs and sealants) We are committed to continuous improvement and really appreciate honest, feed back﻿. 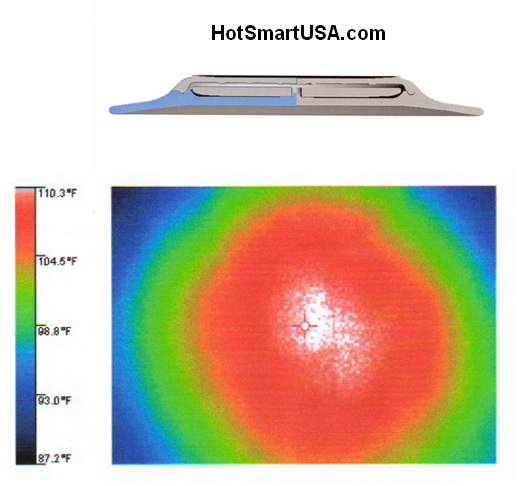 If you get a deffective plate, you can ask for a refund of course (As claimed or your money back guarantee). Question HotSmarts bottom is ugly but so are the back of refrigerators? (Somebody atributed that phrase to me which is a lie). Does this look like the back of a refrigerator to you? Is the plate too flat? Why is the plate heavier? Does the bottom get hot? Does only the center get hot? Ans: No, the whole surface gets hot (except the rim of course); handle it with care (Hotter at the center); If your plate is not getting hot enough, maybe you are using a small (800W) oven in that case you need to increase the preheating time accordingly to 1:30 minutes. Most people learn to use the plates in 5 minutes. Yes, it is a good idea to maneuver your next morsel to the center (Other people do not like it that hot). If you are heating up food on the plate you need to increase the preheating time accordingly to the amount of food and its temperature (Do it gradually to avoid overheating). 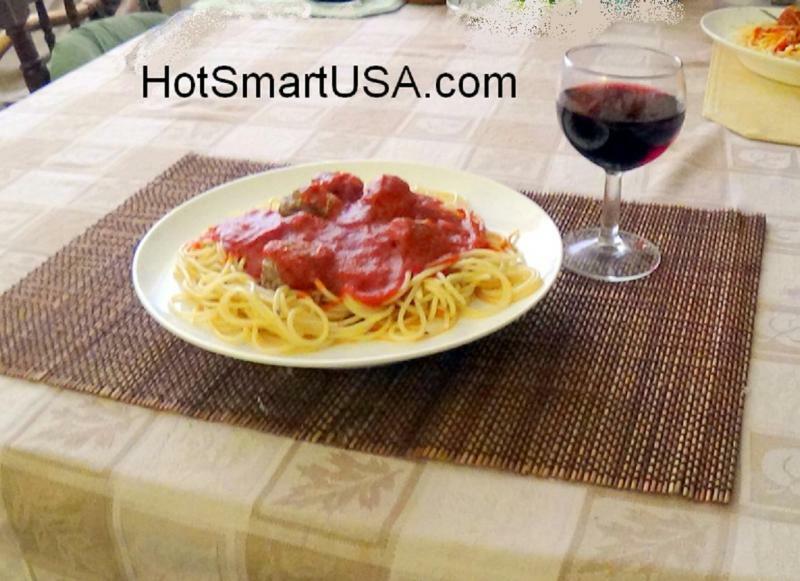 HotSmart Plates do get very hot and stay still hot after 1/2 hour; by then you should have finished eating. What is the delay action? Why can't I preheat the plate for 3-5 minutes or more? Who could be interested in damaging HotSmart's reputation? (This is my own question)? Well... 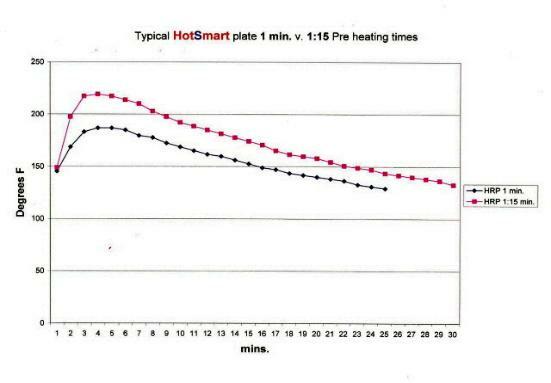 competitors?, huge companies that said it was impossible to make a plate that stays hot for more than half hour by simply preheating it for ONE single minute? People who for some reason lie; what is the need for long vicious comments when they can simply return the product? The SPECS of the plate will show you that this is a quantum leap for the ceramic plate which had not evolved functionally in centuries, however we don't want you to have false expectations; the plates were developed for an specific purpose: to keep food warm at the table so you can enjoy your best recipes; follow the instructions use the plate properly and you will enjoy it for a long time. 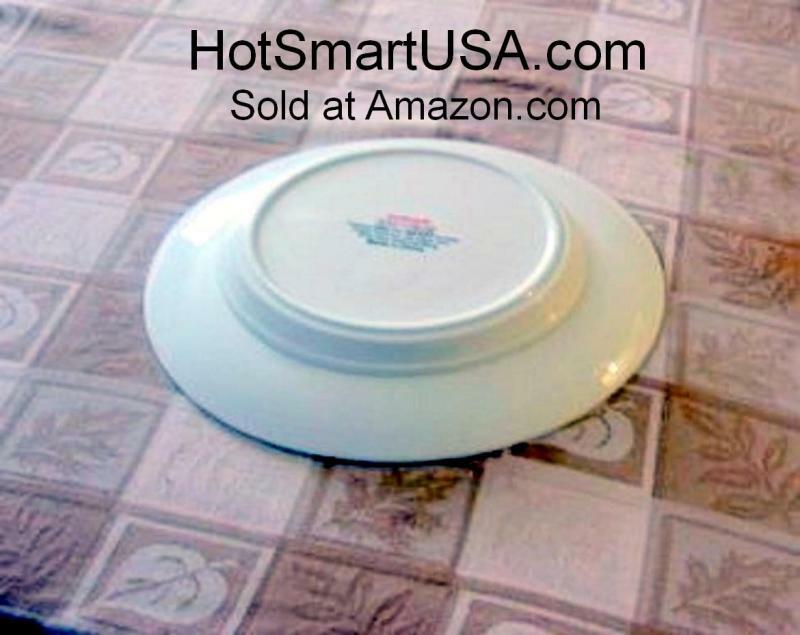 HotSmart Gourmet Plates have also being discovered by caregivers and used by people who have to eat slowly due to some physical disability or mobility problem. 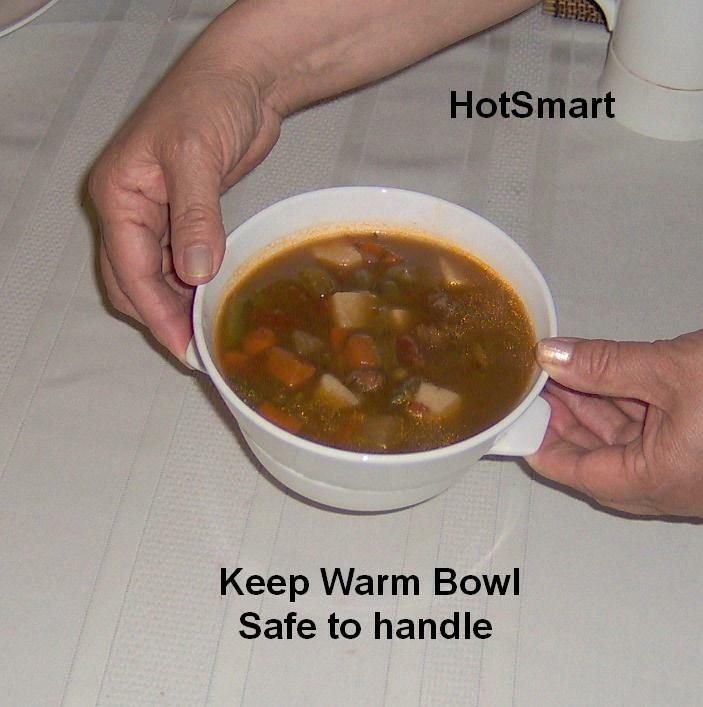 (Ideal for Alzheimer patients, the sick people with mobility problems and of course for people who simply like eating slowly to enjoy their hot meals. Eating Slowly: by the way, eating slowly has so many benefits that we will dedicate an entire section to the subject. If you are of the impatient type, please Google: "eating slowly" (It gets you satisfied with less calories). 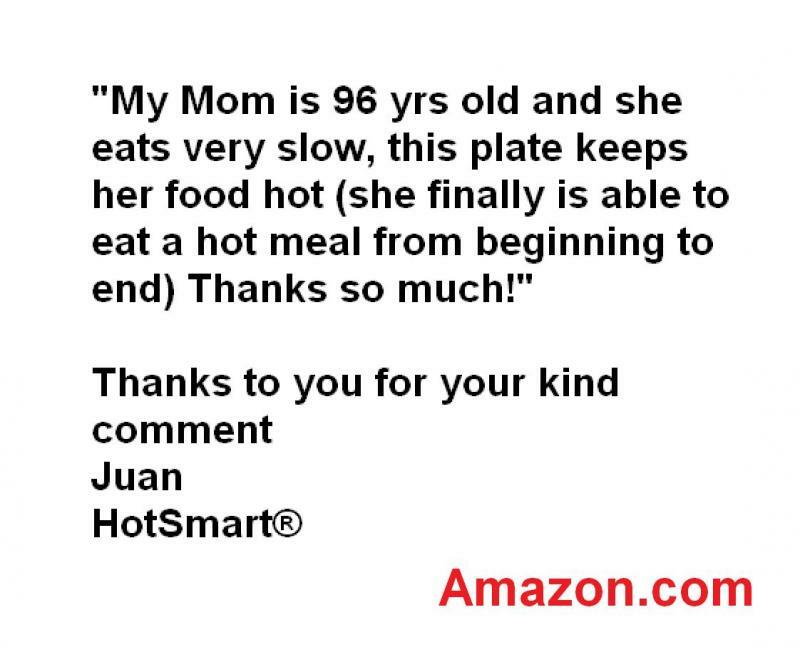 That would be defeating the purpose of the plate which is designed to get very hot in ONE single minute in a full size (1200Watt) microwave oven and remain still hot after 1/2 hour to keep your food hot. 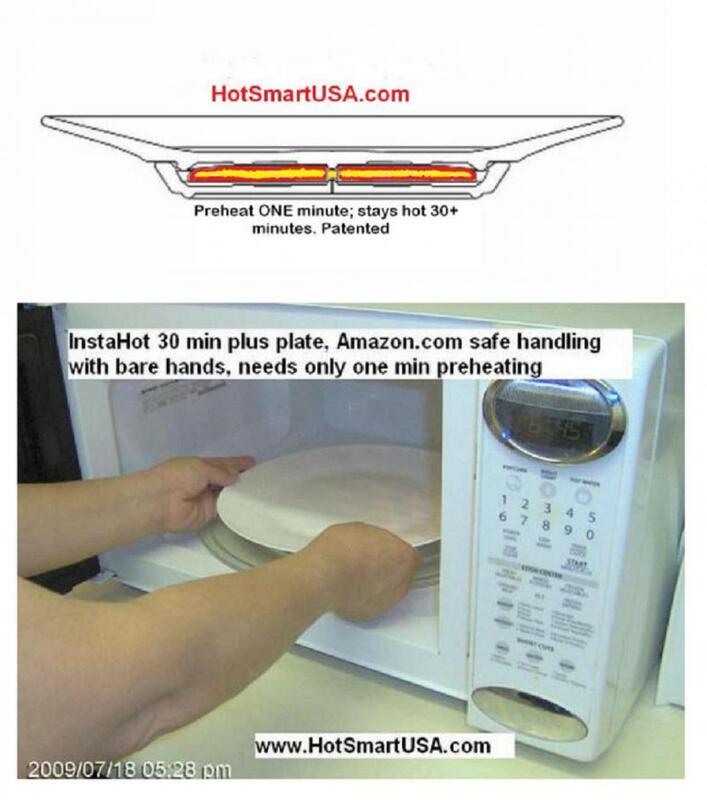 Some people say they should be able to preheat for a longer time; for me it would have been easy to design such a plate but I decided to designed a plate that needs only one minute preheating and remains still hot after 1/2 hour, yet you can handle it safely with your bare hands.